A decade before he was topping the country charts, Joe Stampley fronted one of the deep south's most legendary and rockin' '60s combos, the Uniques. Once signed to Shreveport, Louisiana-based Paula Records, the Uniques made waves nationally on their very first release, 'Not Too Long Ago.' 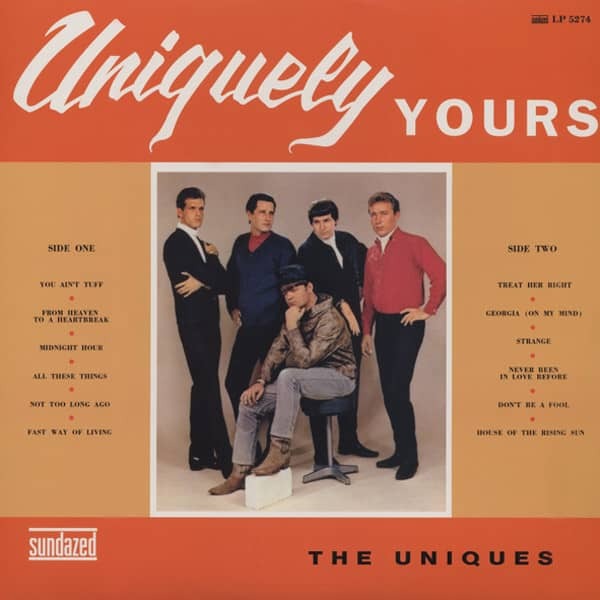 That pop classic (faithfully/recently covered by Nick Lowe) is just one of many highlights of their '66 debut LP, Uniquely Yours. According to the master tape, this record was originally going to be tagged The Uniques in Action; a shelved album title that could not have been more apt. Finally reissued (and in fabulous mono, to boot), this is southern rock 'n' soul at its finest; a real m'lange of styles that swings wildly from deep-fried garage rock, frenzied frat-beat, infectious Stampley-penned pop, and gorgeously soulful ballads. From Presley and Gene Vincent to any Justice label '60s garage band worth mentioning, southerners have always littered their LPs with this latter fare. But when it comes to delivering a soulful ballad, Joe Stampley is up there with the very best of 'em. Uniquely Yours includes the group's all-time biggest regional hit, a cover of Art Neville's 'All These Things' (in its original mix, unadorned by string overdubs) and a 'Georgia (On My Mind)' that simply blows away all other white boy soul renditions. But make no mistake, this is a largely uptempo set marked by the ferocious punk pace of 'You Ain't Tuff,' updated rockabilly funkiness of 'Fast Way of Living,' blistering guitar workouts like 'Strange,' plus some of the best damned covers ever waxed. For a positively unique album experience, Sundazed includes the classy period sleeve design from the original Paula release. Customer evaluation for "Uniquely Yours - HQ Vinyl"